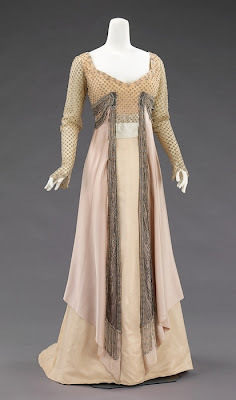 In my travels around the Land of the Internet lately I have noticed countless white (or some version thereof, like creme, or ecru) gowns, ranging from the 18th century all the way up to the 1930s. Most of these examples were evening gowns, with a fair smattering of dinner dresses and some day gowns, and it got me thinking about light-colored clothing in the past. You see, black was not a color well-regarded by women of days gone by. Black was reserved for mourning, and seldom worn in-whole for any other reason. It was not a color young ladies appreciated at all - we have many examples of literary young women complaining about how long they have to wear mourning clothes, for black is so unbecoming. With the black being culturally associated withe Death, naturally white would represent the opposite: Life, health, youth, purity. The preference for light colors started as far back as the late Elizabethan reign, with Elizabeth I appearing in white gowns, as symbols of her purity. 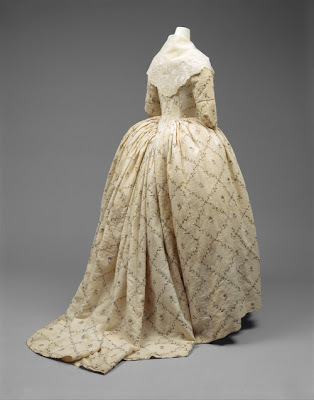 The light colors carried into the 17th c. for both men and women, but by the end of the 17th c. heavy, dark brocades came back into fashion, and we see this all the way into the first quarter of the 18th c. By the middle of the 18th c., pastels and florals on light grounds were all the rage, and when we reach the early 19th c., we see nothing but white muslin gowns for the first several years. 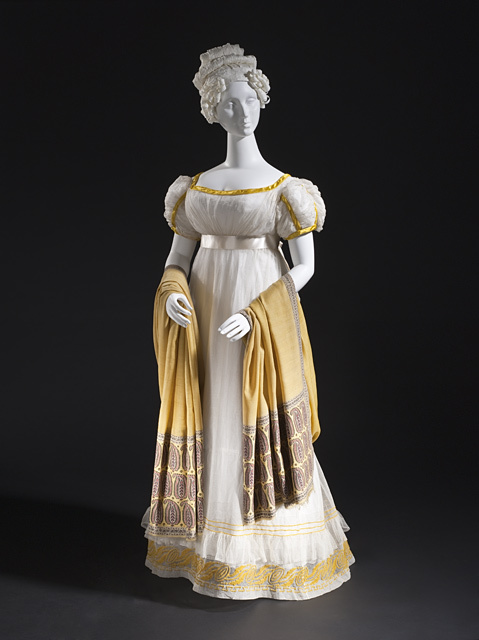 It is in the 19th c. that the color white becomes specifically associated with wedding gowns, but this did not stop everyone else and their mothers from wearing light colors. We see it all the way through the 19th c. and into the Edwardian. The light-ness finally comes to a screeching halt with the invention of The Little Black Dress, in the mid 1920s, by Coco Chanel. 1865 (Met?) 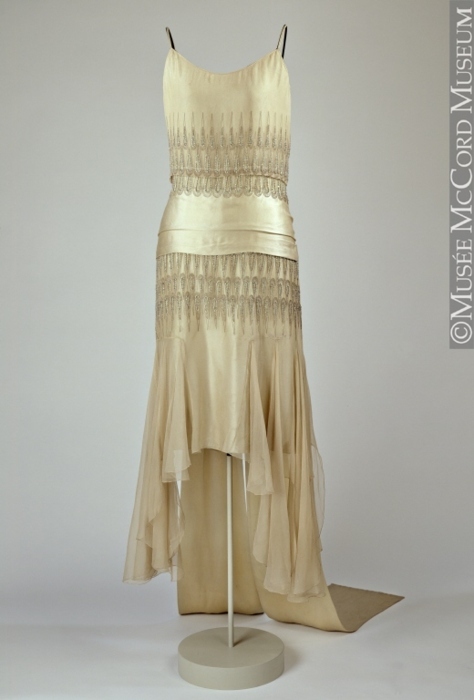 a stunning confection in creme, light greens. So why all the love for light colors? Well, I think a little common sense can help us with this one. Light colors flatter young ladies and make them stand out in dark rooms, such as lamp-lit dance halls and dining rooms. All of that glistening light-colored silk, beading, and sparkly trims make for stunningly shiny and eye-catching ladies when everything is lit by candles. I believe the fabric and trim choices for clothing directly correlate with the development of gas lights and then electricity. What do you all think? So in thinking about this, I consider the next ballgown to be made, and I find myself being drawn towards a champagne color, or a creme, with pretty same-color trims, beading, texture. What is more beautiful than white-on-white-on-white? More beautiful examples to be had at OMG that dress! Very beautiful dresses! 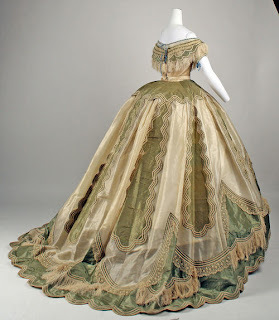 I love the 1820's dress and the bustle dresses (fourth picture). I love the light colors and the trims on both! The first dresses in the LACMA "European dress 1700-1915" were all in creams/whites - one for each major silhouette of it's time. Really keen. I think you're right about the lack of lighting being somehow related to the color of clothing. Anything too dark just couldn't be remarked upon for the beauty it was at an evening event. Most equestrian stuff I've seen is in darker colors - but that just could be because it could hide the shmutz of being around animals and dirt and outside better. I think you guys are right - rank and wealth probably had much to do with what colors one was wearing. While white underclothes of linen were easier to keep clean than colors, because of the ability to scrub and bleach, the white silks would have been horrible to try to keep clean! 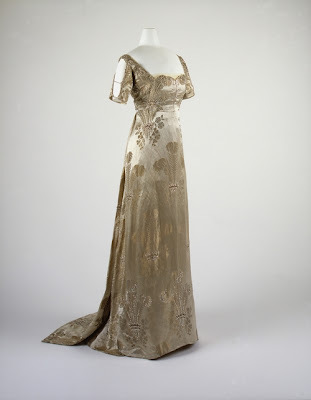 Ah, I do see the difference, but I also wonder about the requirements of the cut of a dress for evening (versus day) and the use of black - evening gowns were normally low-cut in the neckline, and bedazzled with beads and trims - I think this would be true of an evening gown still in mourning. Then there are different stages of the mourning period, where different "fun" things were permitted after a certain period of time, to include the addition of color back into one's wardrobe (purple.). I think I need to research this more. I am not disagreeing with you, just noting that my interest is piqued! oh, also, I think we begin to see many more examples of non-mourning black the later into the Victorian era we go. The images in the album you linked, with the exception of two, are all from the 1880s and newer. I think the two that appear to be portraits from the 1860s are still mourning gowns, just with an evening cut. This popularity for black could very well tie directly in with the death of Prince Albert in 1861, and Queen Victoria's preference for black clothing from there on out. Absolutely agree! In fact, any lady (even today) who will attend an event with proper candle light should pick her fabrics with that fact in mind. Many pretty colours can look like a ver dull, unbecoming brown in candlelight, and anything sparkly, like gold spangles or lace, will make her glitter. I personally prefer gold or silver on white, but am sure you'll look stunning in your white-on-white combo! 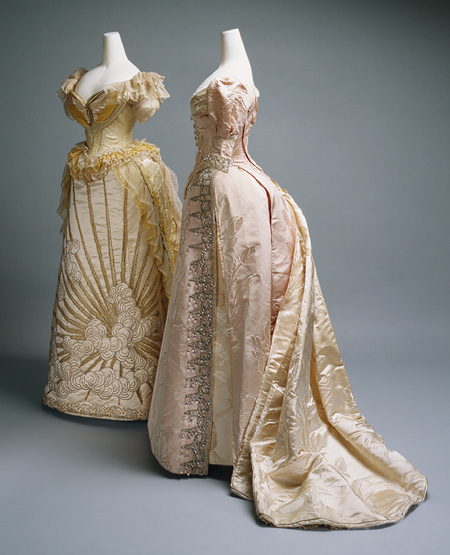 I bet in the 19th century many white dresses could have been debutante dresses? In the beginning I had trouble to tell them apart from wedding gowns, until I realized that in prints wedding gowns are always day gowns, never sleeveless, and always depicted with a veil. So: White evening dress without veil: Not a wedding dress. Ooo, very good point, Alisa, about the debutantes. I hadn't thought of that! I love silver or gold on white, too. Or a creamy champagne goldey-white. Those worth gowns are just sitting in my brain percolating, haha, not that I could ever re-create one with all that intricate couture detail, but I love the shapes of them too! Blackcat's comments about the prevalence of black in Victorian women's wardrobes also got me thinking about black clothing as it pertained to Victorian-era photography. There's a great blog - F*Yeah Victorians (http://fuckyeahvictorians.tumblr.com/) that has a plethora of old tintypes, daguerrotypes and other Victorian photography, and I noticed that in almost every one the sitter is wearing a dark color. I think we assume these garments to be black, although any dark colored materials, such as blue, grey, emerald green, burgundy, and purples, would have come out looking "black," especially if the photo was underexposed as we see in many tintypes. However, with the photographic technology of the past (and even today! ), there is considerable trouble in shooting whites. You can see in some Edwardian photography, where the sitters are wearing white, that they are often blown out, or their skin looks very dark because the photos had to be purposefully underexposed to account for the white gowns. This makes me think that perhaps it was common practice to wear your dark colored clothing to the photographer's studio - the photographer may have even insisted upon it - so as to make a nicely exposed photo. This is not to say that there were not cultural attachments to the clothing being worn, etc., just that it may be another factor in why we think the Victorians were always wearing black. I found some more black dating back further. And I question if there is such thing a mourning ball gown, since it would have been in very poor taste to wear such revealing clothing or to go out to balls or parties or the opera while in mourning. Ladies were supposed to stay home and be sad. Its about more then the clothing, its the mourning lifestyle that many girls did not like. The entire subject is very interesting, and there is a lot to find out. Scrumptious! I think it is a well known fact that I have a major weakness for light colours, and some of these gowns are already in my wish list! I *love* dress 3, but I don't think it is from the Met. Dress #1, #4, #5, #6 are.